It began with the core philosophy of providing trusted and affordable skin care brand for Filipinos; 22 years later, Diana Stalder Face, Body, Skincare and Cafe remains committed to delivering the promise of a better you. Services. It offers a variety of skincare treatments that address the needs of even the most delicate skin type, complemented by highly skilled therapists, to ensure delivery of desired treatment results. Products. The company sources the distinct premium formulations from Stalder Laboratories, an FDA-approved quality manufacturing facility, that is GMP-certified (Good Manufacturing Practice), and compliant to the ASEAN Harmonization for Cosmetic Regulations standards. It also distributes the same products to international markets, which includes the USA, UK, Europe, and Asia. Specialists. Their team of aesthetic specialists adopt comprehensive and personalized approaches for each client’s needs, and provide extra guidance on lifestyle and physical enhancement options. Café. Because of their holistic approach to beauty, Diana Stalder also expanded their skincare center to include a cafe; a health and beauty hub offering healthier alternative meals, snacks, and beverages suited for weight and waist watchers. 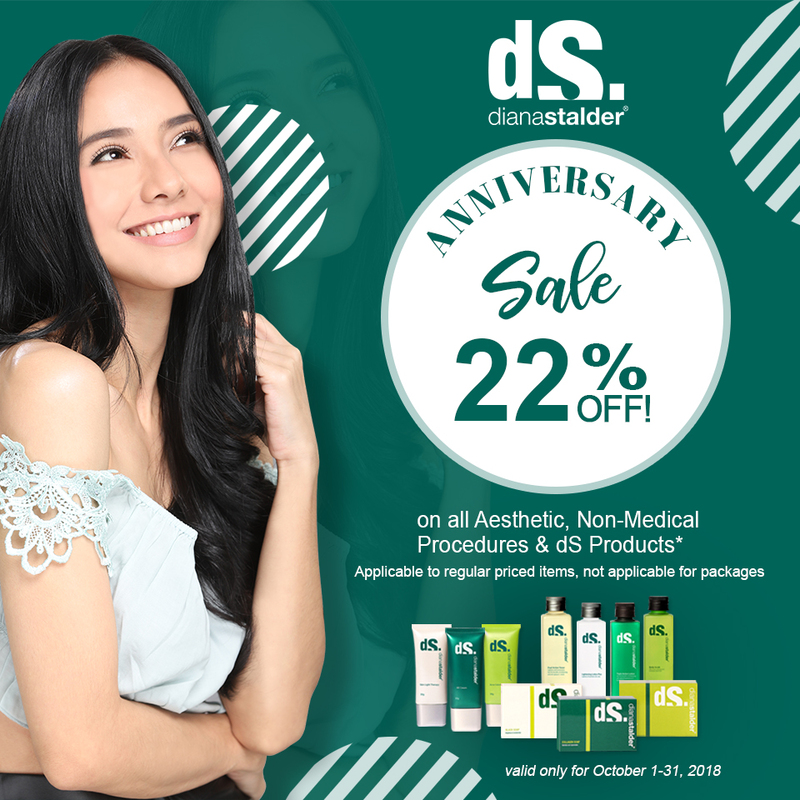 As the celebration of its 22nd anniversary begins on October 1, 2018, you can enjoy the best products and services they offer at 22% off until October 31 only! PhP22 on participating products plus exciting deals and giveaway awaits you on October 18-21 on all branches. 3. Not applicable to bulk purchase. Maximum of 22 pieces per person per day only. 4. Promo is not valid in conjunction with Senior Citizen Discounts, Diplomats or other promos or discounted packages. 5. Availment of service is strictly by appointment within October 2018 only. Hurry and book your appointments now!